Bagel Nash has moved into the space previously occupied by the noodle shop on Wheeler Gate on the opposite side of the road to the old Virgin Music Store. It only just seems to have opened, when I walked down Wheeler Gate on Friday suddenly it had appeared, it was open, and not only that, it was packed out and was too busy to get a table. This Saturday, at lunch, there was more room so I popped it to get a bagel and settle down on one the barstools along the wall. I read that it officially opens on the 28th March so it looks like they may have opened a little earlier possibly a soft launch to iron out any kinks and get up and running. A little research told me that it is part of a small, yet burgeoning chain primarily based in the north expanding outwards from Leeds. They have just 14 stores mostly in Manchester, Leeds and York, there is also one in Derby. After a few moments contemplation I selected the “Crayfish & Avocado” Deli Bagel on a Sesame seed bagel. 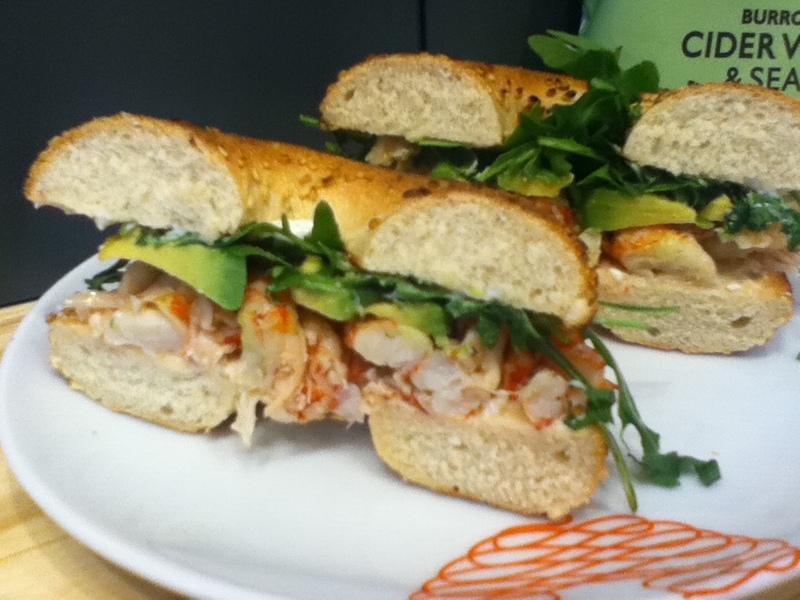 This is described as a bagel of ‘crayfish, avocado, rocket, mayo, lemon and pepper’. It was £3.30 to takeaway but marked up to £3.99 if you choose to eat in (bit of a pricy mark up in my opinion). I had the meal deal which was a drink and crisps for £5. The bread was soft and chewy the lightly toasted bread had a nice warm nutty sesame taste not as dense as some US bagels I have had before. The filling was quite delightful, creamy avocado slices together with plenty of crayfish. There was a light lemony mayonaisse that was oozing slowly out through the bagel hole and there was a good decent amount of crunchy peppery rocket. I was not that convinced that the bagels would be any good over here in the UK but to be honest I thought this was better than some I was treated or rather not treated to in America, overall I really liked this bagel. I am not saying that I have been converted into mass bagel consumption but I might be tempted into having more that one a year. If you get there earlier in the day, then quite dangerously for some of us, I see that they are doing a selection of breakfast bagels, including a ‘hot crispy bacon’ bagel. I really wish that they had kept that knowledge away from me, and then looking a little further down the menu my eyes just alight on the ‘Breakfast Bagel Deluxe’ which is one filled with ‘scrambled egg & smoked salmon’. What is that saying again? “A little knowledge is a dangerous thing”. Yes it is! Goddam you bagel people! I shall stand firm and resist temptation. 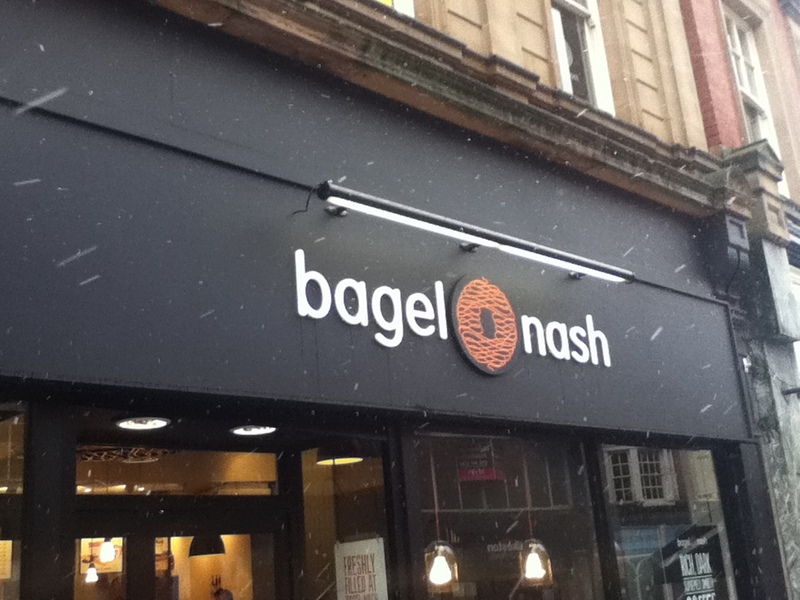 This branch of Bagel Nash is at 5a Wheeler Gate just around the corner from the Old Market Square Tram Stop. You can check them out and what they have to offer bagel wise on their website, follow them on twitter or see them on Facebook or the old fashioned way just walk in and look at the menu board. great work! You recognize, a lot of people are looking around for this information, you can help them greatly.